It’s a problem many of us face. Recently I found a cure, though I fear it will be temporary. 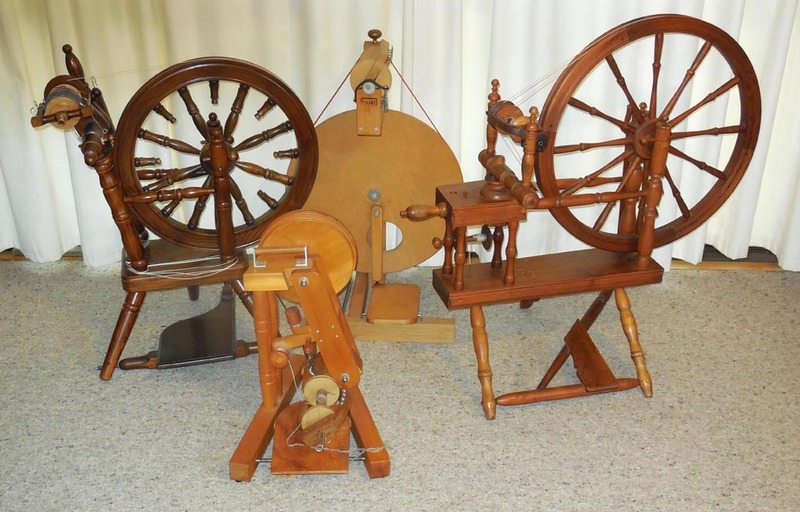 I own four spinning wheels, and between them they have at least 20 bobbins. I decided to use it all up in a variegated knee rug. 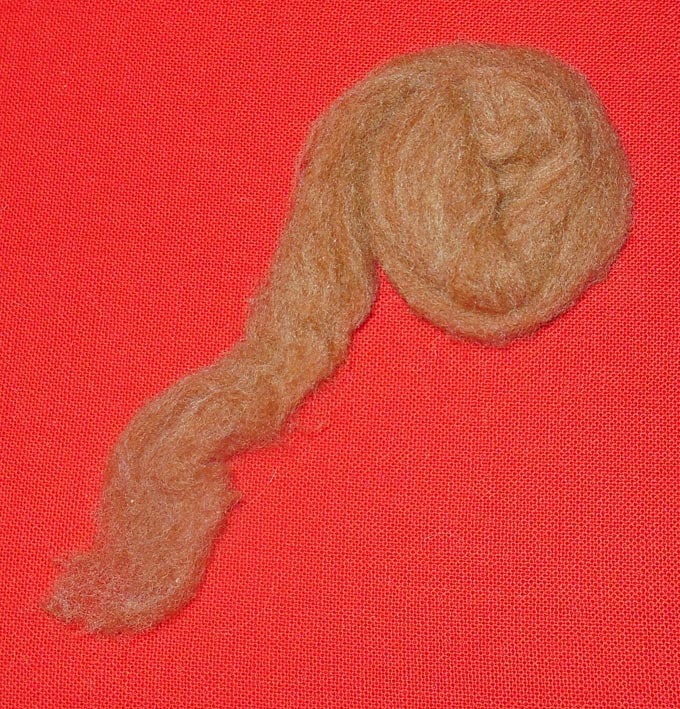 I had 500 grams of carded wool from a flock of Romney/Down breeds origin, in a gingery brown moorit colour that didn’t really go with anything. So I spun that up and then started plying it with all my oddments. It went pretty well, though there was so much variety in the leftover singles that some of it came out nice and thick and some was too thin and skimpy. When that happened I added a third thread, generally some white or cream silk (I’ve attended several workshops on spinning silk). There were occasional bits of alpaca, too. 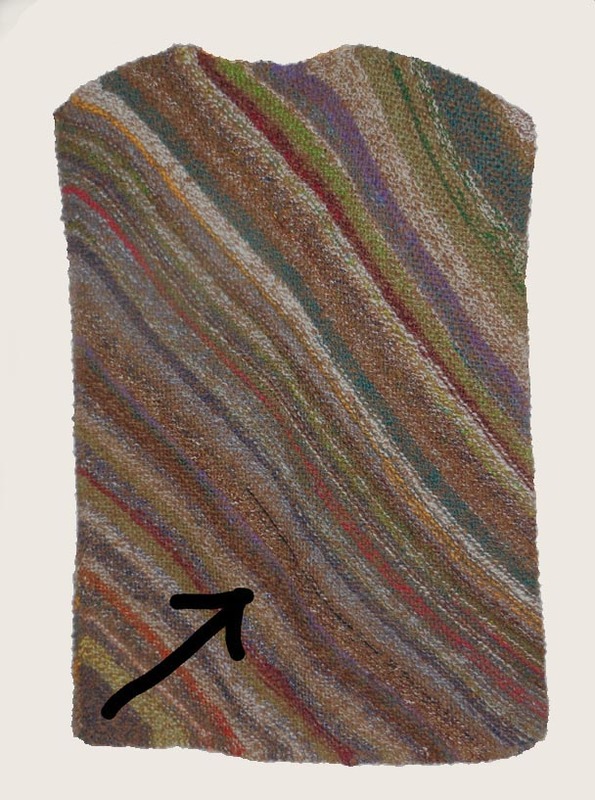 I made a rule that it all had to be animal fibre, though a tiny stripe of cotton snuck in somehow. It was fun deciding which oddment to ply next. I tried to vary between light and dark, bright and dull. If there was a lot of something I didn’t use it all at once, because I didn’t want enormous blocks of one colour. I ended up with some skeins I was rather pleased with, and I apologise for not having any pictures of them. I wish it had occurred to me to take progress photos! Time to knit. The easiest way to make a cosy knee rug is in garter stitch, starting in a corner with 3 stitches. Increase at the beginning of each row till it looks as though it’s half way there, and then decrease at the beginning of each row down to 3 stitches again. Actually there was one refinement – at the beginning of each row I knit two stitches and then knit twice into the 3rd stitch. This gives a nice edge. 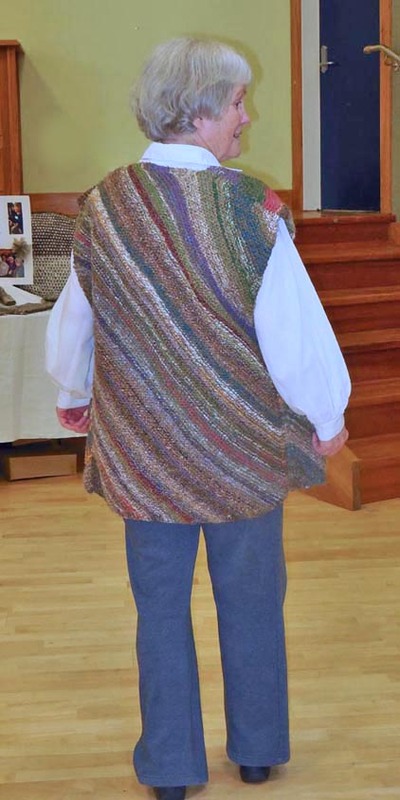 The triangle grew, and I liked it, and I started thinking “I want to wear this!” I imagined a jacket made of a big rectangle at the back, and two narrower rectangles for the fronts. 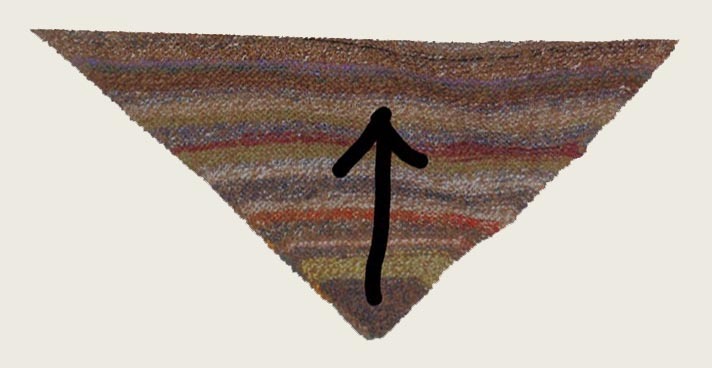 So when the sides of the triangle got to the width that would fit across the back, one side changed from increasing to decreasing at the beginning of the row – it became knit 2, knit 2 together. When I thought it was long enough I decreased at the beginning of each row down to 3 stitches and ended it. Simple, except that I tried to put some shaping on the shoulders, which is hard to figure out if you are working on the diagonal. But I (sort of) managed. The fronts would have been just as easy, except thatI wanted a slanted neck opening. Like the one on the left. 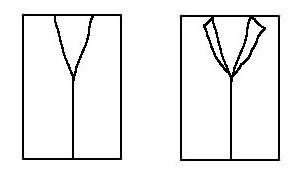 Now if I’d been happy to make a couple of simple rectangles for the fronts, and treat the top centre corners as lapels like the one on the right, it would have been easy. But as it was, I had somehow to add decreases to slanted knitting, which was already being increased on one side and decreased on the other. 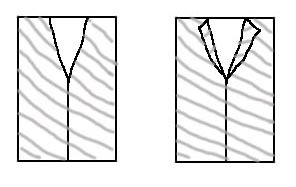 The grey stripes in this diagram represent rows of knitting, and you can see that on the right front I was already decreasing at the centre front, and on the left front I was increasing. There was much frogging (rip it, rip it) and picking up the stitches and my good temper and trying again. I don’t recommend the procedure to anyone but a talented mathematician, which I am not. However, it was eventually finished. And at our recent Guild spin-in I modelled it proudly in the fashion parade. If you think I look happy in these pictures, you are right. And it wasn’t only because of the jacket. If you will forgive some personal detail – I was happy just to be there, because less than 4 weeks earlier, I had undergone a mastectomy for a suddenly-discovered breast cancer. I hadn’t dared hope for such a quick recovery. But it was caught in time and though of course there is never certainty, right now the future looks bright. In recent weeks I have learned the value of wonderful supportive friends, and of organisations that are there to help. I have learned the importance of being open about cancer, too, and not hiding it or only mentioning it in whispers – as a result, my two daughters have now enrolled in New Zealand’s free breast cancer screening programme, as have several of their friends. There are all kinds of support out there, and amazing people who will share their experiences. Nobody needs to go through it alone. This entry was posted in Uncategorized and tagged cancer, knitting, leftovers, spinning on September 21, 2017 by maryinnz. In the First World War (as later in the Second) knitted items like warm socks and balaclavas were an important contribution to parcels sent to the troops by organisations like the Red Cross and the Navy League. Around New Zealand, women formed groups to knit; but in wartime, wool and the factories to spin it into yarn are soon diverted to more pressing uses. 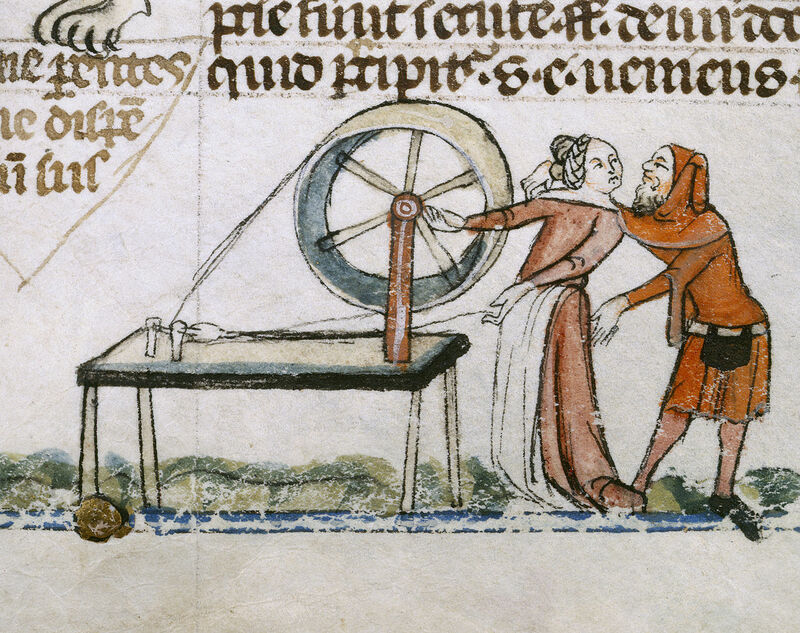 So in many places, out came the spinning wheels. 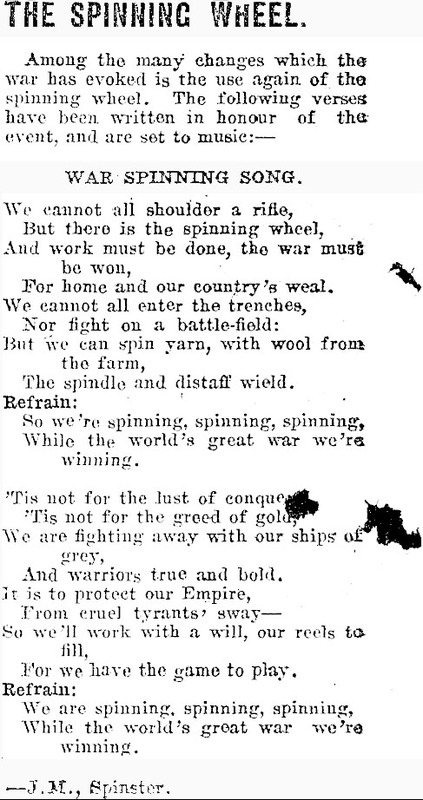 That ‘charming patriotic song’ (so says the cover page – it has an even more ferocious second verse and no mention of knitting despite the title) – came from Britain. There were New Zealand composers too. One was Miss Jane Morison, of Masterton. Born in Scotland in 1855, she had come to New Zealand with her family in 1870. She became a music teacher, and composed a number of stirring songs, most of them during World War One. Her ‘Spinning’ has recently been rediscovered. 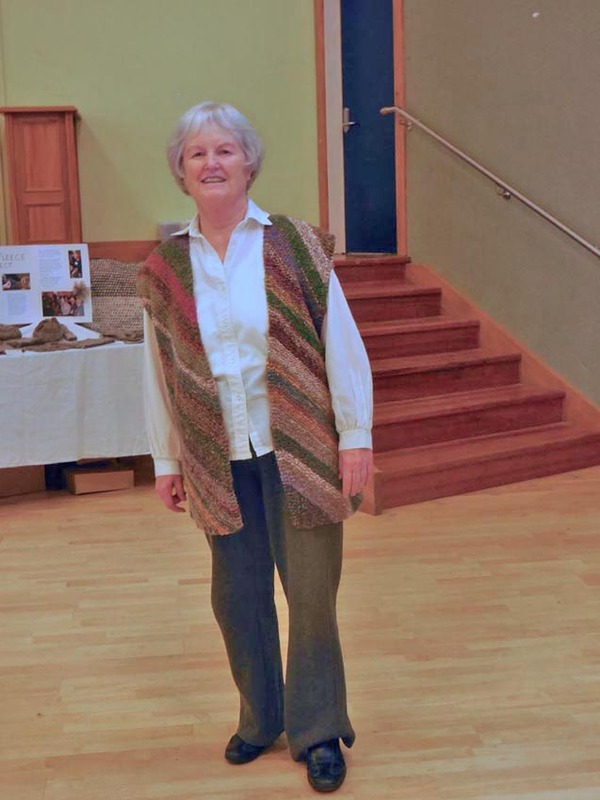 It would be nice to know whether Jane Morison was a spinner herself; the mention of ‘wool from the farm’ certainly rings true in the Wairarapa, where sheep have been farmed for generations. The words were published in the Wairarapa Daily Times on October 2 1917. The sheet music (with slight changes in the words) was published in 1918 ‘with the object of encouraging a spirit of practical patriotism in young people’. The cover proclaims that it was ‘Dedicated to Patriotic School Girls’. Since then the song has been forgotten for many years, but here it is and it was actually sung at the Wairarapa Spinners and Weavers Guild’s recent Christmas party. If you would like to sing it too, click below to download the sheet music. This entry was posted in Uncategorized and tagged spinning, women in wartime, World War 1 on December 17, 2016 by maryinnz.